With Mother’s Day just around the corner, we’ve put together a list of our favourite Mother’s Day Gift Ideas! Whether it be a brand new set of luggage, an Anti-Theft travel bag or a sleek Bellroy wallet or phone case, Mum is sure to love it! Check out our list of Mother’s Day Gift Ideas here. You truly cannot go wrong with our selection of Bellroy Phone Cases and Wallets. With plenty of colours, styles and sizes to choose from, practicality is Bellroy’s strong suit! With majority of their phone cases and wallets, you’ll find a handy sim card & remover pin slot – this is perfect for those who travel often! Crafted with beautiful environmentally certified leathers, spoil your Mum with a wallet or phone case update- or better still, combine the two! Shop Bellroy NZ wide at luggage.co.nz and enjoy a selection of carefully crafted leather wallets and phone cases. Above products: Top Left: Bellroy Folio Leather Wallet in Alabaster RRP: $199.00, Top Right: Bellroy Clutch Leather Wallet in Navy RRP: $249.00, Bottom Left: Bellroy iPhone 7+ Phone Case Plus – 3 Card in Eucalyptus RRP: $99.00, Bottom Right: Bellroy Pocket Leather Wallet in Deep Blush. RRP: $159.00. 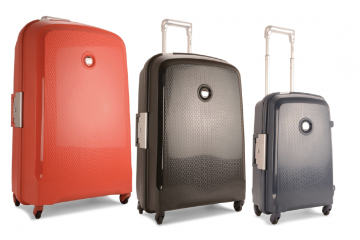 A favourite for us here at luggage.co.nz, the Luna-Air range comes in a selection of colours that Mum is bound to love! Available in Pink, Teal, White, Grey & Black, the Luna-Air is a sturdy, lightweight all-rounder hardside suitcase. Pamper Mum with a new suitcase set from Explorer. Shop Explorer NZ wide, exclusively at luggage.co.nz! Another favourite for us here at luggage.co.nz, Pacsafe’s range of Anti-Theft Travel Bags are truly special. Full of Anti-Theft properties, majority of their products are slashproof, RFID blocking and have tamperproof locks- ensuring hassle-free travel. Give your Mum the gift of safe travel with our range of Pacsafe items. Shop Pacsafe NZ wide with fast, free shipping and stay safe while on the go! Above Products: Top Left: Pacsafe Citysafe CX Wristlet Wallet in Tan: RRP: $89.00, Top Right: Pacsafe Citysafe CX Anti-Theft Tote: RRP: $269.00, Bottom Left: Pacsafe Stylesafe Anti-Theft Crossbody Bag: RRP: $129.00, Bottom Right: Pacsafe Daysafe Anti-Theft Tech Crossbody Bag: RRP: $79.00. Lightweight and full of organisation features, the So-Lite 2.0 Softside Suitcase from the New Zealand Luggage Company is a great way for Mum to travel. The Teal being a personal favourite of mine, the So-Lite 2.0 packs well and looks good- the Teal being super easy to spot on the baggage carousel! Shop the New Zealand Luggage Co. NZ wide with easy 100 day returns at luggage.co.nz! Sophisticated and oh-so perfect for Mum, Lipault’s Travel range is a stylish way to travel. Our favourite’s being the Plume Accessories Toilet Kit in Pink, the Lady Plume Medium Weekend Bag & the City Plume Cross-Over Bag, there’s something for every Mum! Shop Lipault NZ wide with fast, free shipping at luggage.co.nz. Above Products: Left: Lipault Plume Accessories Toilet Kit in Pink: RRP: $65.00, Middle: Lipault City Plume Medium Cross-Over Bag in Teal: RRP: $89.00, Right: Lipault Lady Plume Medium Weekend Bag in Purple: RRP: $139.00. Always a classic, Samsonite have a selection of sophisticated, classy suitcase ranges that are absolutely ideal for Mum. The Samsonite Octolite is a stylish pick, while the Samsonite Uplite is a beautiful option for Mum. Inside, you’ll find organisation features such as cross-ribbons and mesh dividers, along with four spinning wheels, telescopic handle systems and TSA approved in-built locks, travelling with a Samsonite case is an absolute breeze! Shop Samsonite NZ wide with free shipping and easy 100 day returns at luggage.co.nz! Treat your Mum to a good night’s sleep with a pair of headphones, wireless or unwired from SleepPhones. An ideal way to travel and for everyday use, SleepPhones are perfect for those who have trouble sleeping on planes or enjoy the comfort of music throughout the night. Shop SleepPhones NZ wide at luggage.co.nz in a range of different colours- wireless or wired! Along with these Mother’s Day Gift Ideas, we have a full page on our website adding plenty of extra gift ideas for your to choose from! Check it out here.